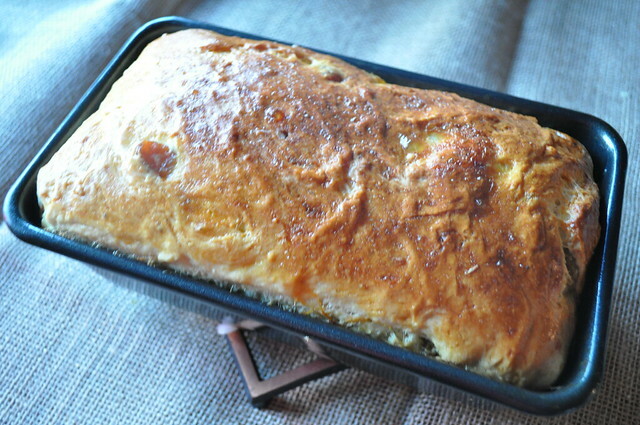 Paska is a traditional Ukrainian Easter sweet bread. It’s normally braided in a fashion similar to challah and the three braids represent the Holy Trinity. The traditional round shape of the bread also represents God, and remind us that God has no beginning and no end. According to Wise Geek, Easter food originated in the Ukraine or Poland. And it’s believed that this type of food was introduced to the U.S. by people of the Mennonite Faith. 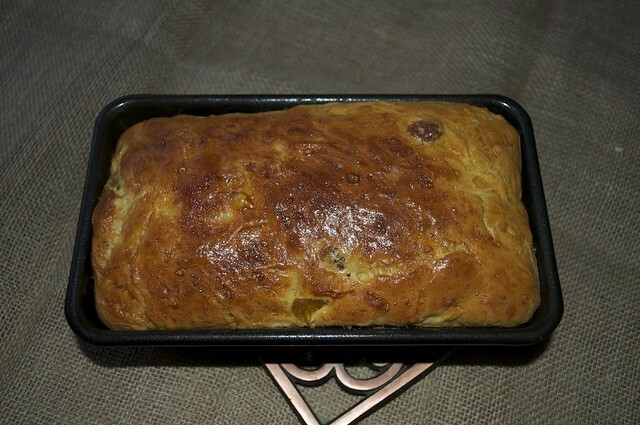 Normally, Paska or Babka is made with very few ingredients and is a very simple bread. It may seem like a lot of steps, and we won’t lie to you, it will take up a good chunk of your day. But let us tell you, it’s totally worth it. This was the first bread we’ve ever made, and we think it’s a great starter bread because it’s not that hard to make just time consuming. But hey, the best things take time right? **We apologize in in advance for the blurry photos, we didn’t realize that the lens was dirty. So sorry in advance. 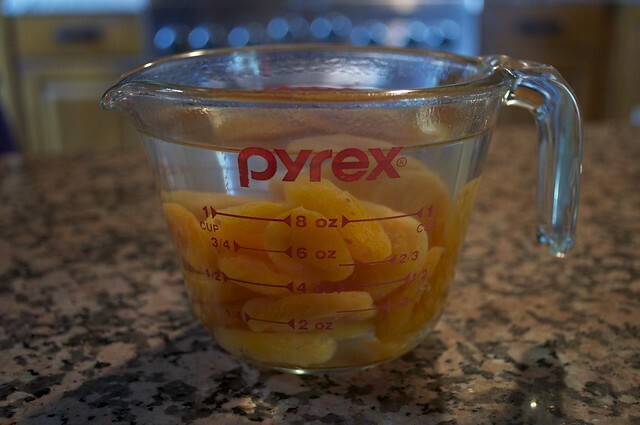 If you’re in a hurry, put raisins in a bowl and cover with hot water to plump them up. 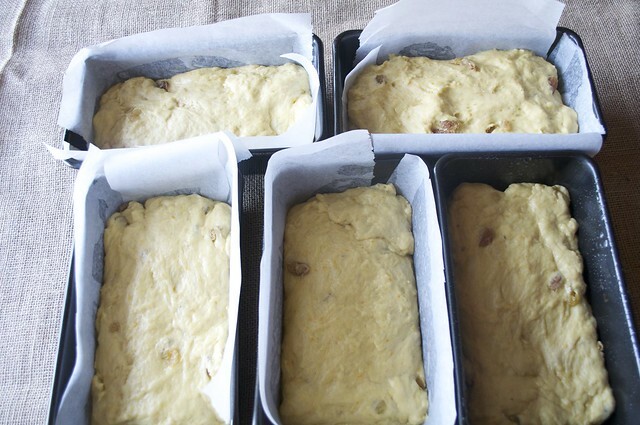 If you have the time, it’s best to cover the raisins with your choice of triple sec, orange juice, or even water and let them sit over night to really reconstitute them. 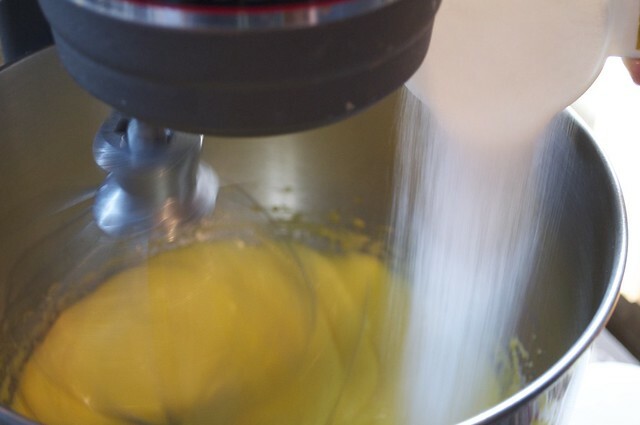 Dissolve 1 tablespoon of sugar in 1 cup of lukewarm water. 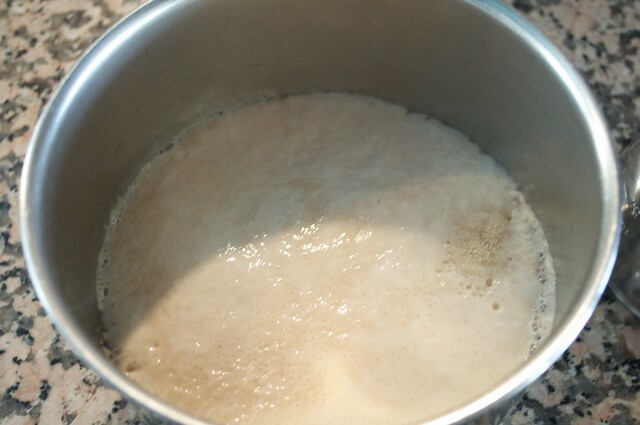 Sprinkle the yeast over the water and let stand of 10 to 15 minutes. 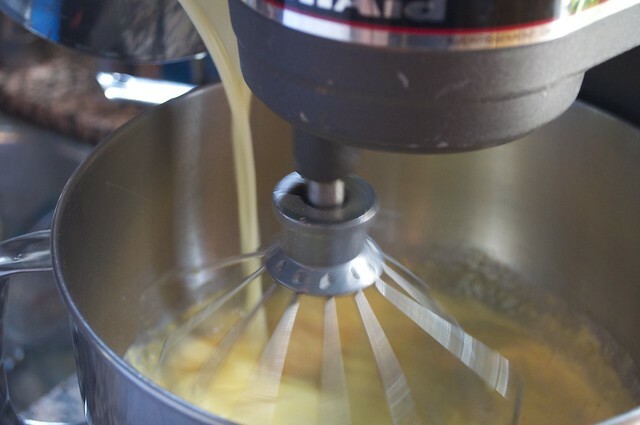 In a stand mixer (or with a hand mixer) beat eggs on a high speed until light in color. 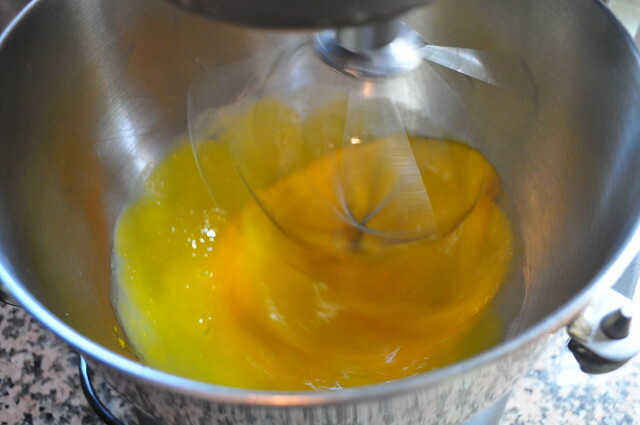 Next, add the sugar gradually while the mixer is still beating the eggs. 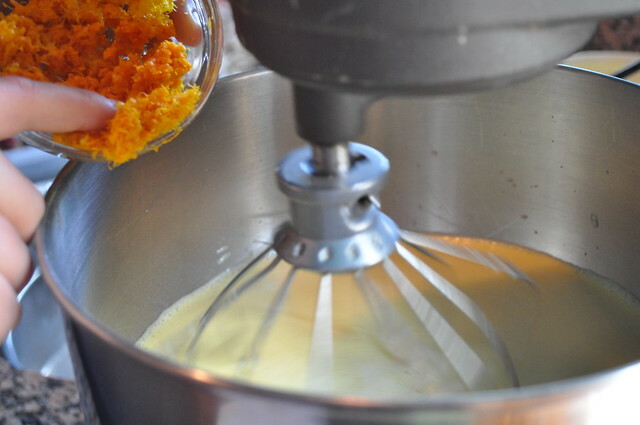 Add the salt, cooled milk, zest of the lemon and orange, orange juice, and melted butter. Mix until combined. 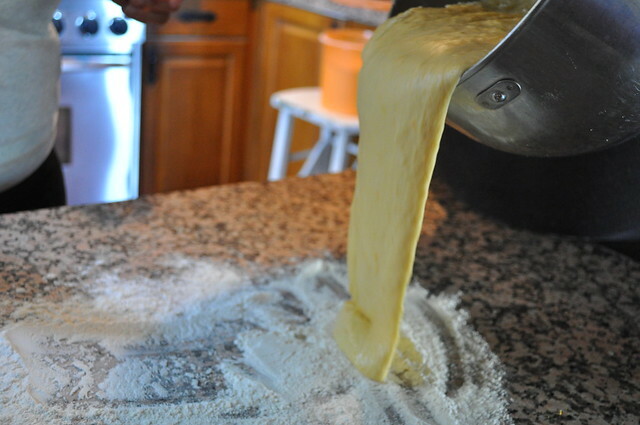 If using a stand mixer, replace whisk attachment with dough hook. 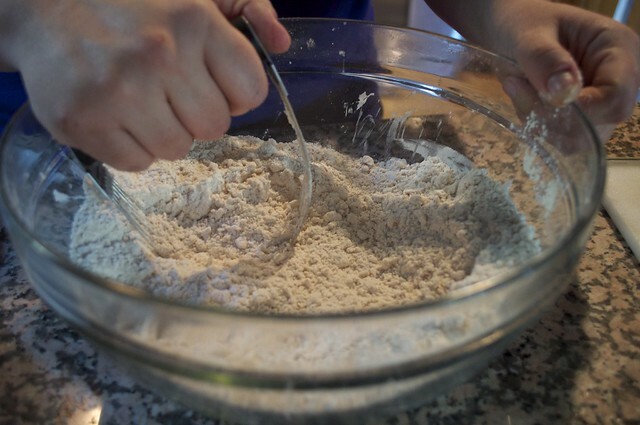 Start very slowly adding the flour, about a 1/4 of a cup at a time. 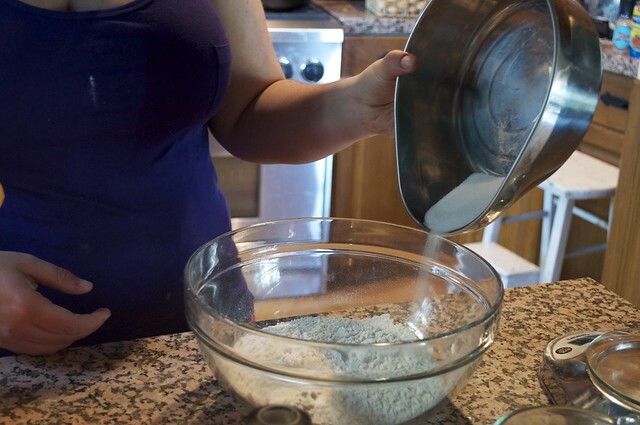 Do this until all flour is incorporated. 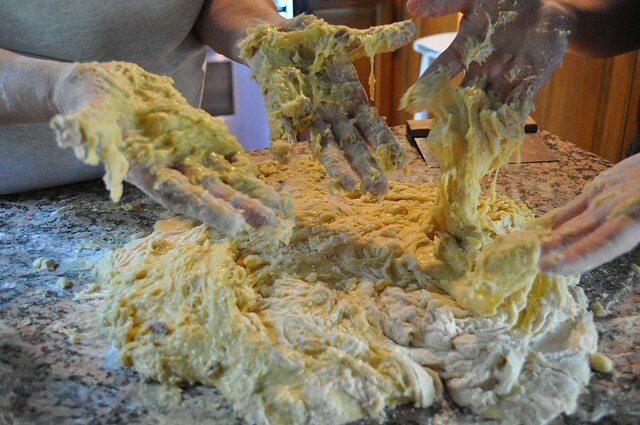 This will be a very sticky dough. 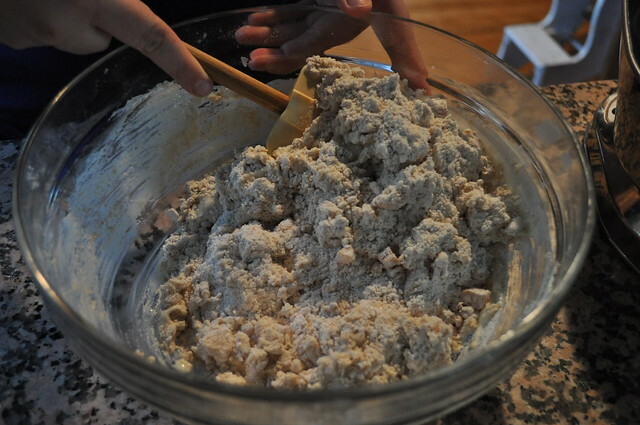 Next transfer the dough to a floured counter-space, add the drained raisins to the dough and continue kneading. 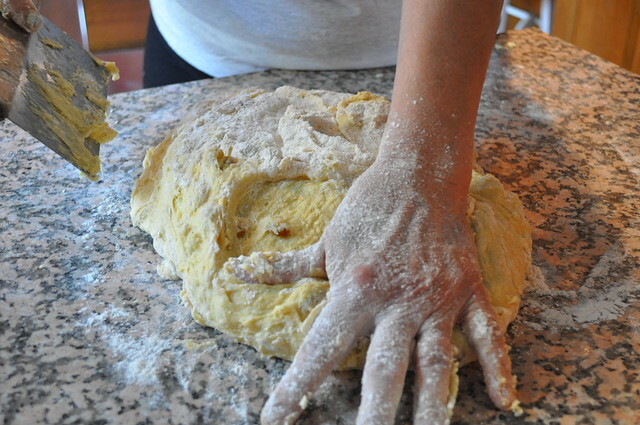 Add flour as kneaded (heh heh). 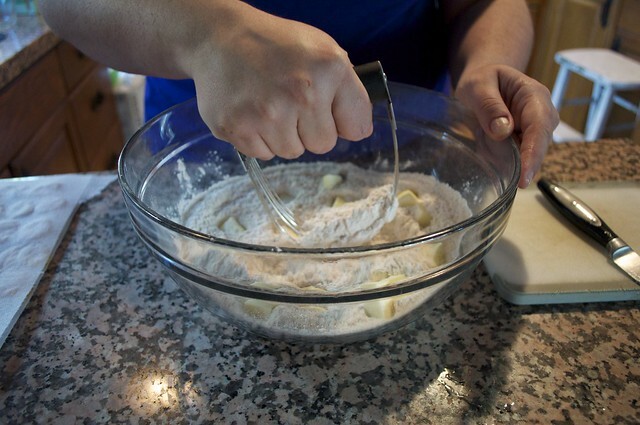 Pace in a large bowl, and cover with a damp dish towel. At this point, turn off the oven (and open the oven door to let out some heat). 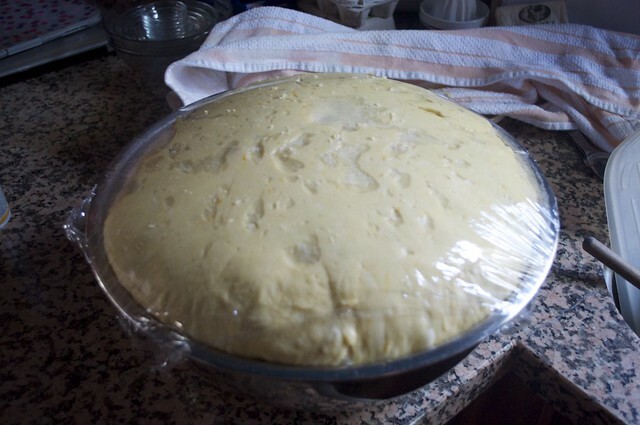 Place the covered dough in the oven and allow to proof (raise). This all depends on where you are, how hot it is. It took ours about an hour and half to double in size. 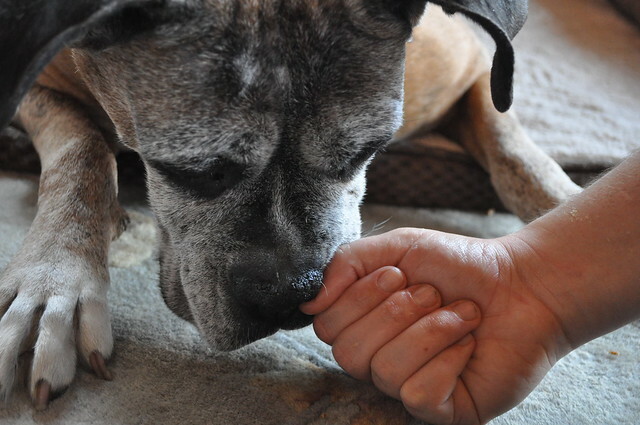 While we waited for the dough to rise, we played hide the treat with Peaches. 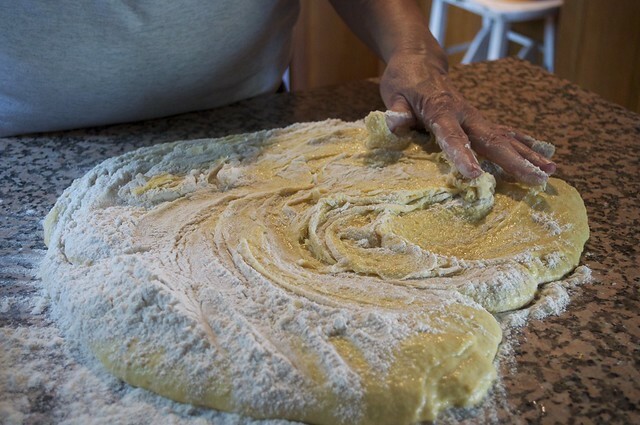 Once the dough has doubled in size, punch down the dough again, and let raise again. 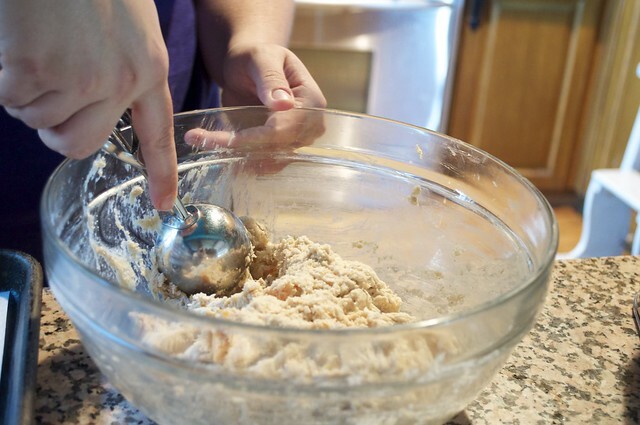 While the dough is rising, prepare your bread pans. 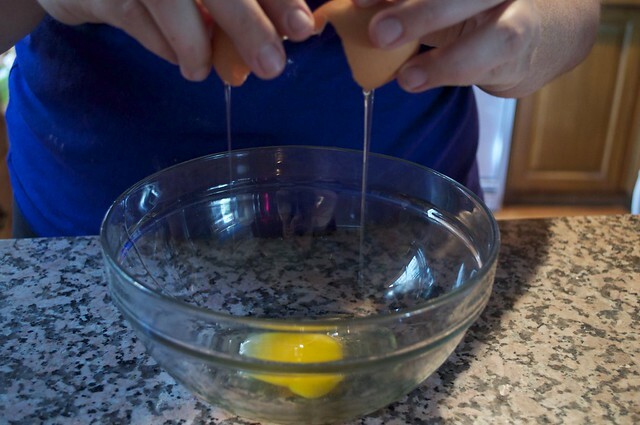 Now there are two ways to do this, the first is to butter the pan, and then cover with parchment paper. Or, you can just spray cooking spray. Both work perfectly, and it’s really your preference. 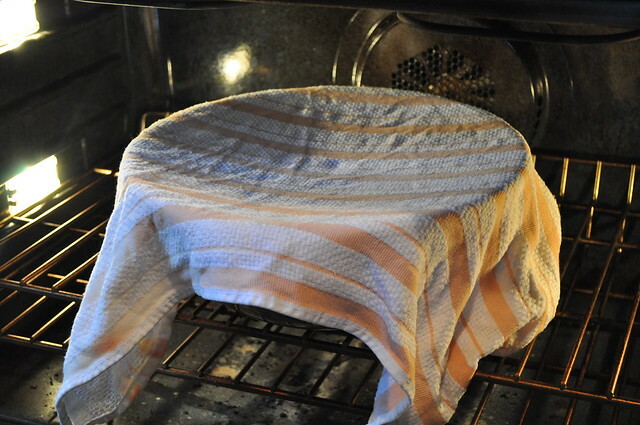 Divide the dough between the pans (we used FIVE) and once again cover with a damp dish towel, and let double in size. Preheat the oven to 375°. 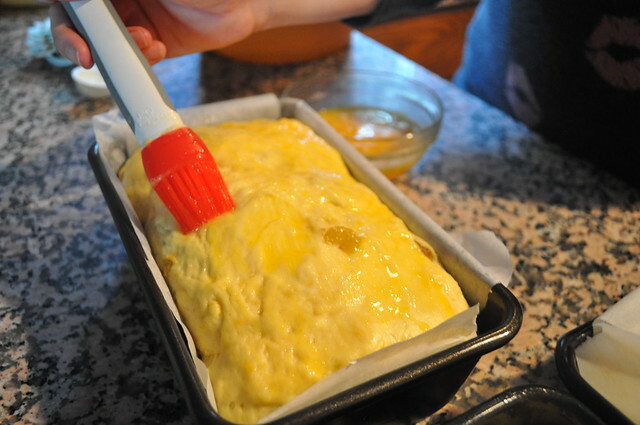 Before you put the loaves in the oven, mix together one egg and two teaspoons of sugar and brush over the loaves. Bake at 375° for 10 minutes. 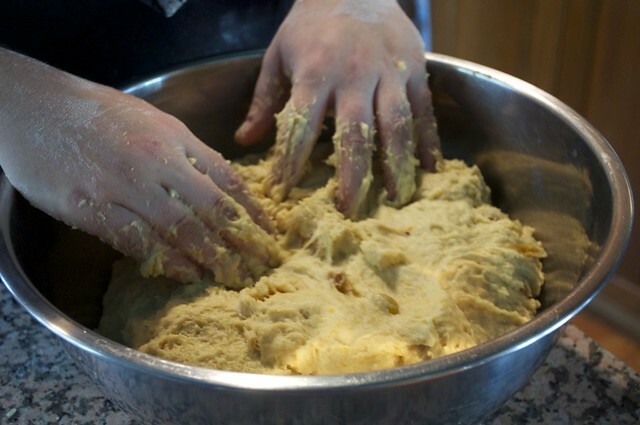 Then lower the heat to 275° and bake for 25 to 30 minutes or until the the internal temperature reads 185° to 190°. 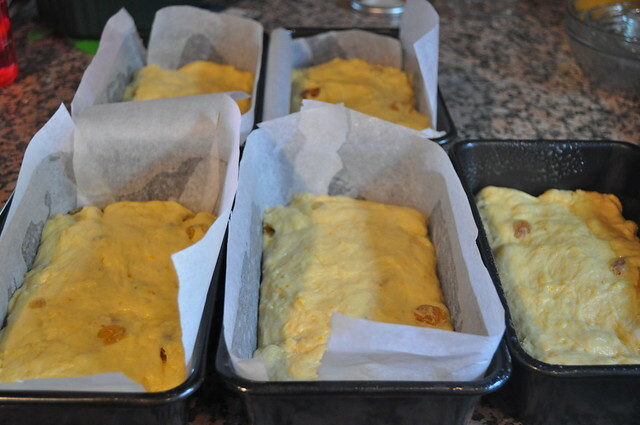 When the loaves are done, remove from the oven and glaze with sugar dissolved in water. Let stand in the pans for 10 minutes before removing. 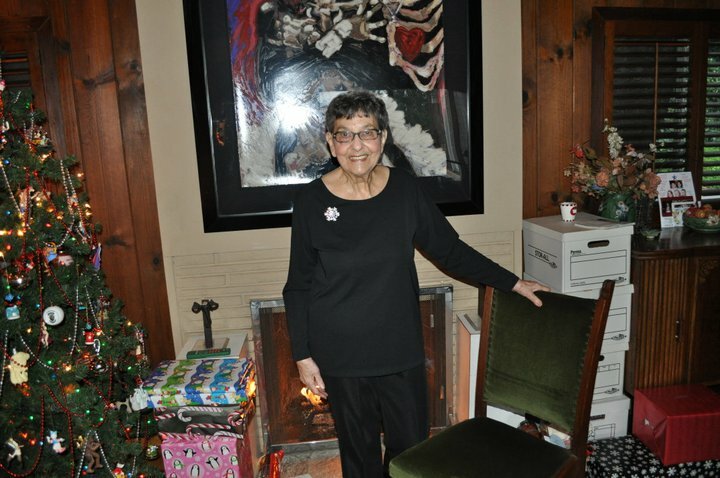 The traditional way to enjoy this bread (according to Aunty Alyce) is toasted with a little butter. 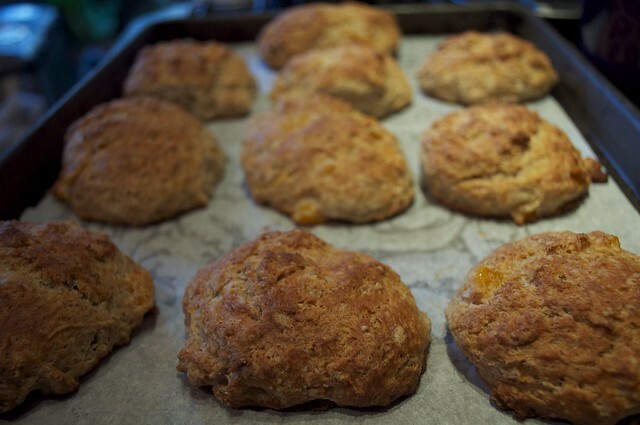 The word scone actually comes from the Danish word ‘schoonbrot’, which means ‘beautiful bread’. Though some would argue that it actually come from Stone of Destiny, which is where the Kings of Scotland were crowned. 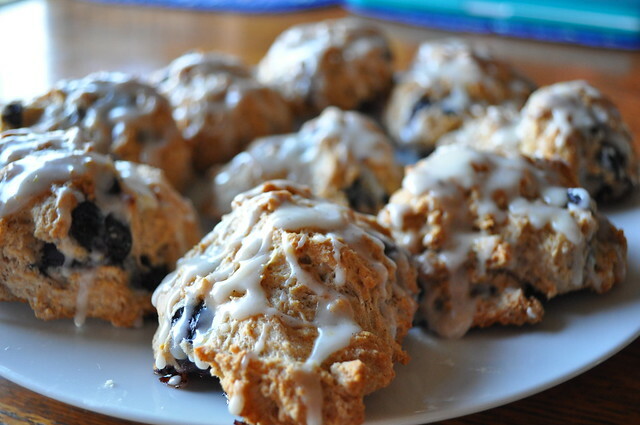 And finally according to Webster’s Dictionary, scones originated in Scotland in the 1500’s. Whew. That’s a lot of information, so do with it what you will. 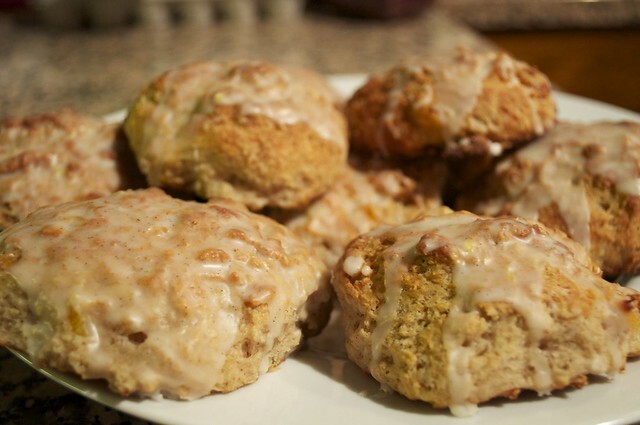 But either way, Scones are a delicious morsel of tasty goodness. 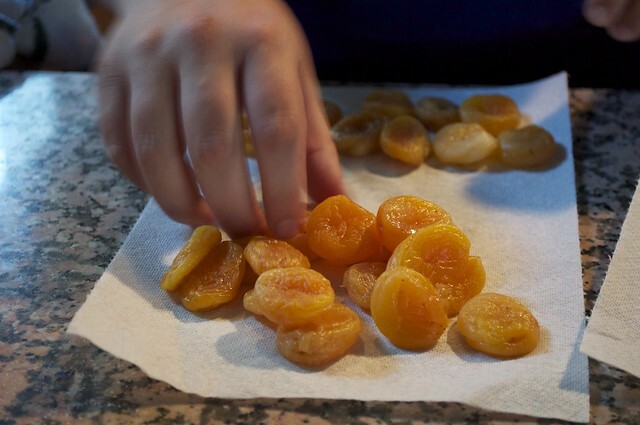 Our recipe this morning was inspired by The Kitchen, the first time we made them we followed the recipe using apricots. The next day we made two different version, blueberry with a lemon glaze and apple with a maple glaze. 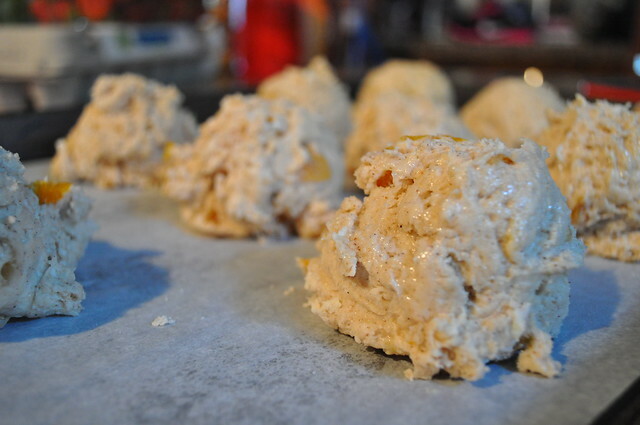 At the bottom of the page you will find the variations we made for the scones. All three scones were delicious and we enjoyed all of them. 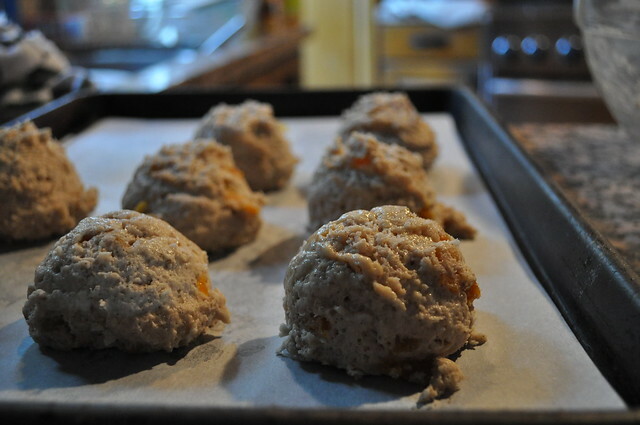 First thing, preheat your oven and line a sheet pan with parchment paper. 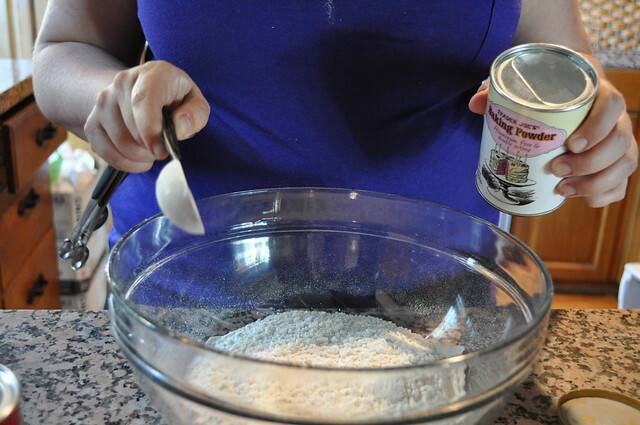 We spray the bottom of the pan with pam to prevent the parchment paper from moving. 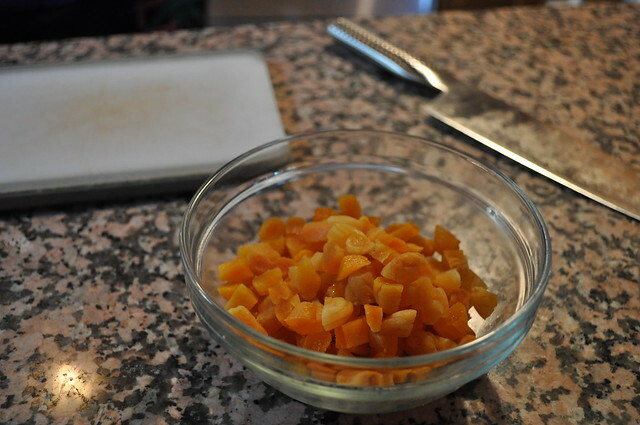 In a small bowl, cover the apricots with almost boiling water and allow to sit for 10 minutes to fatten up. 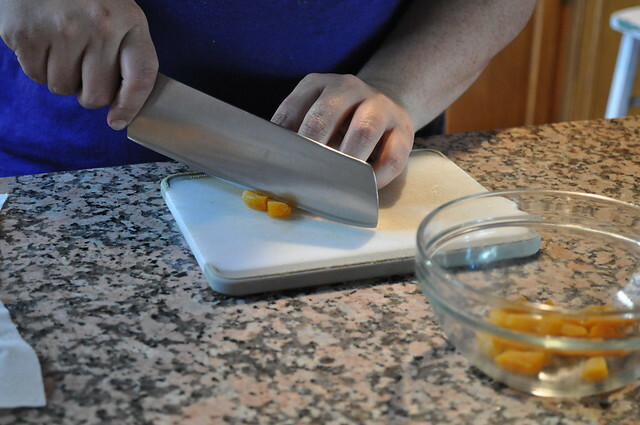 Drain, pat them dry and chop them roughly. 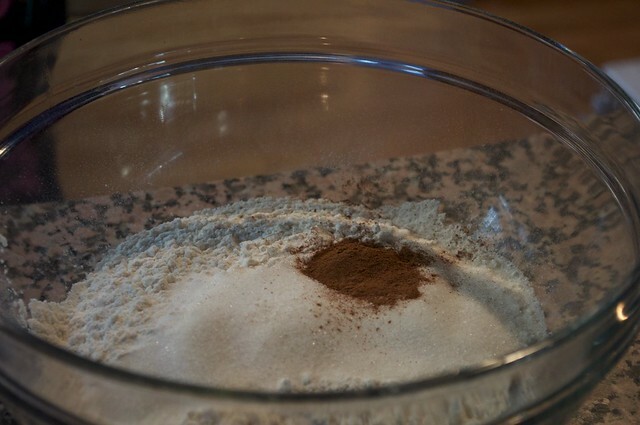 In a medium bowl, whisk together the flour, baking powder, sugar, cinnamon, and salt. 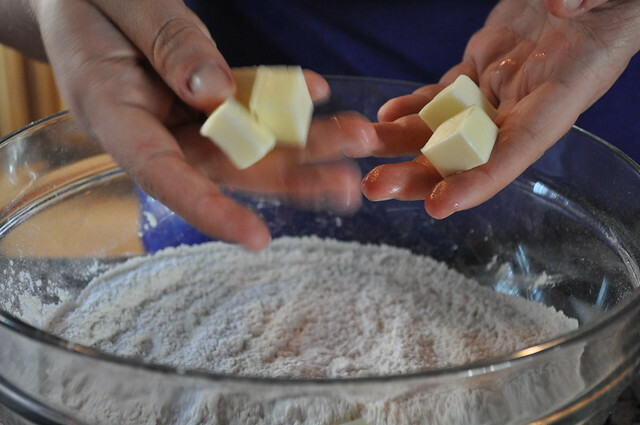 Using a large fork or pastry cutter, “cut” the butter into the flour. 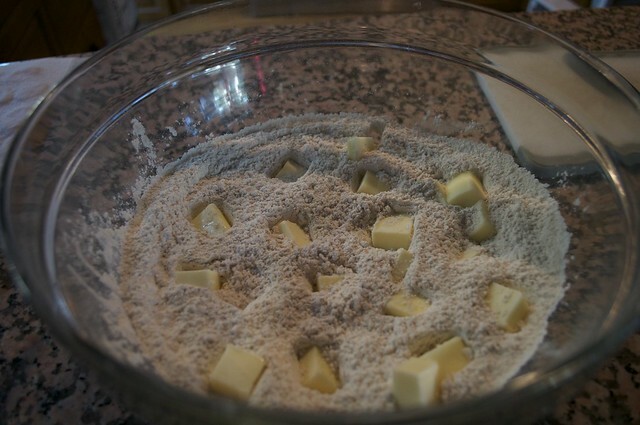 Cut the butter and flour mixture until the butter pieces are no larger than a pea. 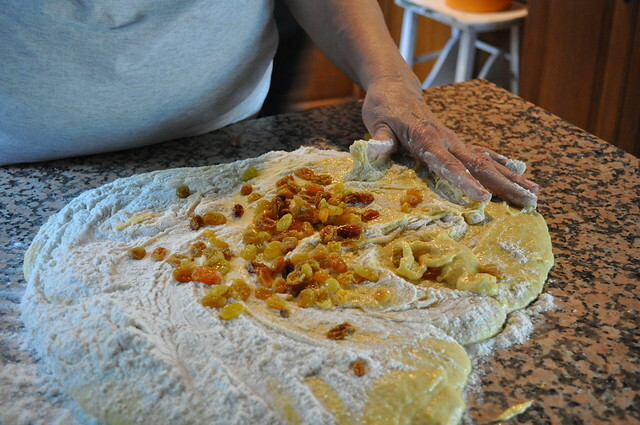 Gently fold the apricot pieces with flour and butter to coat the pieces. 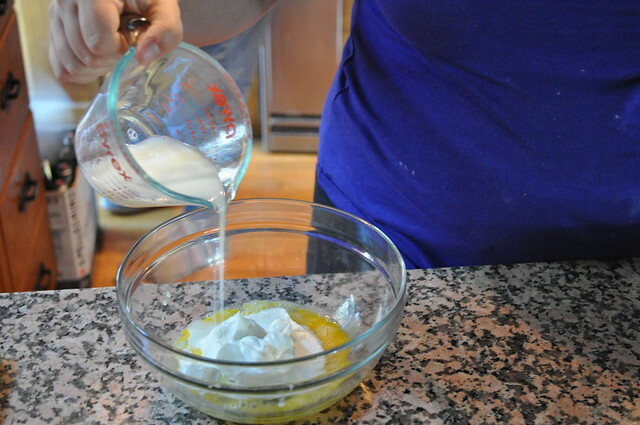 In another bowl, mix together the egg, milk, yogurt and vanilla. Pour the wet mixture of the dry mixture. 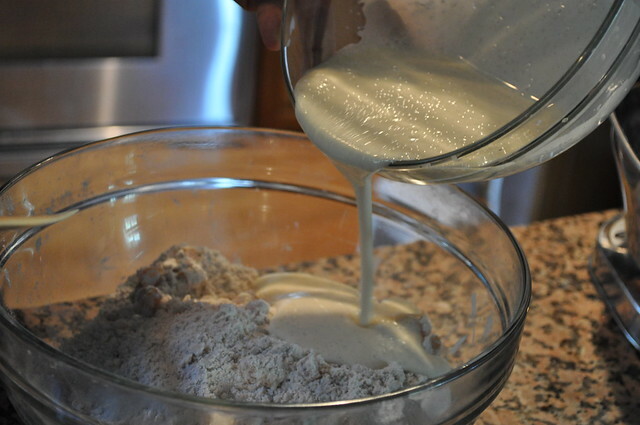 Mix gently until the flour and yogurt mixture are just combined. 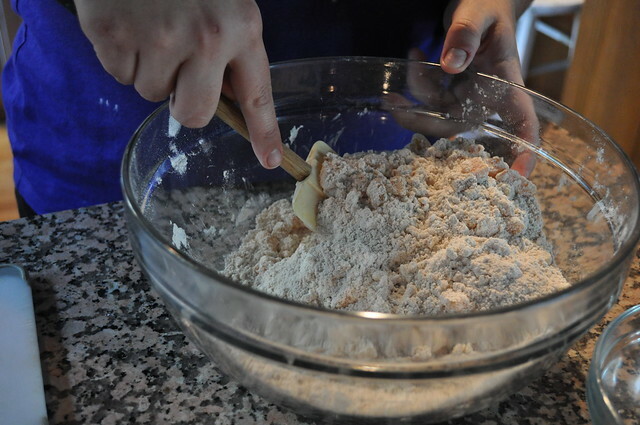 No visible flour, but don’t over mix! 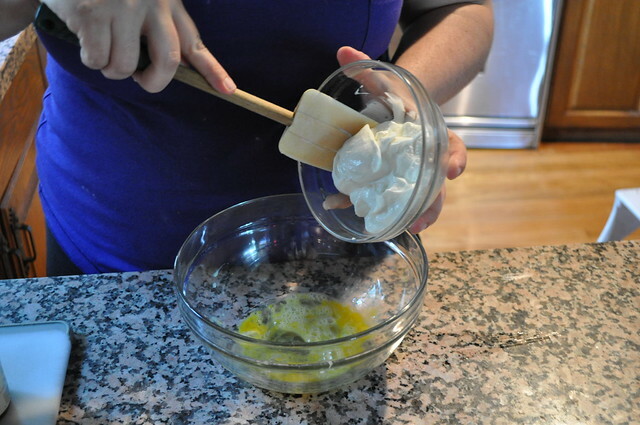 If using an ice cream scoop, spray with pam before using. 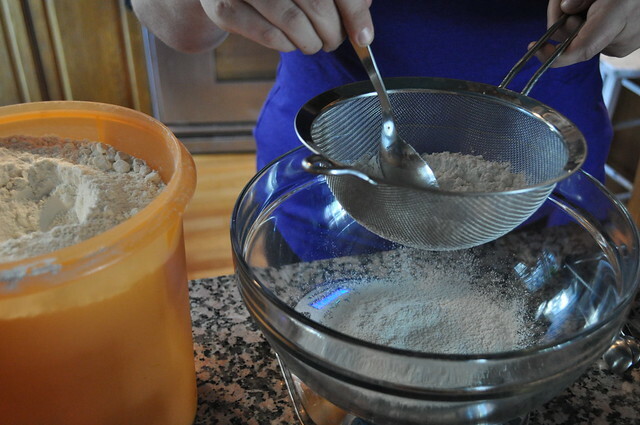 This helps keep the dough for sticking to the scoop. If you don’t have an ice-cream scoop, that’s okay. 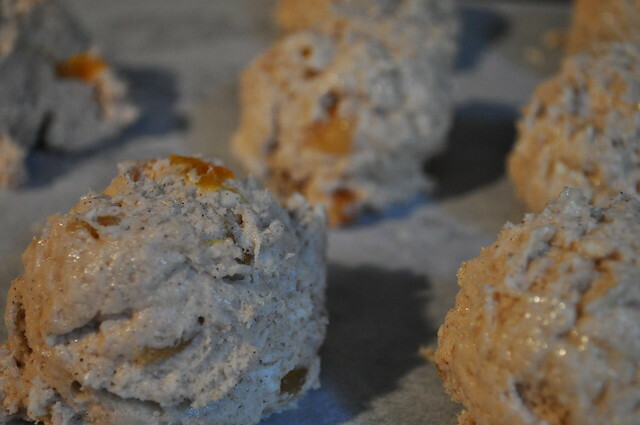 Scoop the dough and drop onto the parchment paper. About an inch apart. 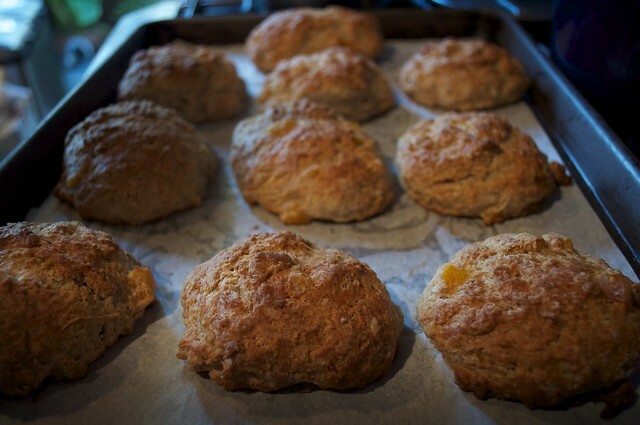 Gently flatten the tops of the scones. 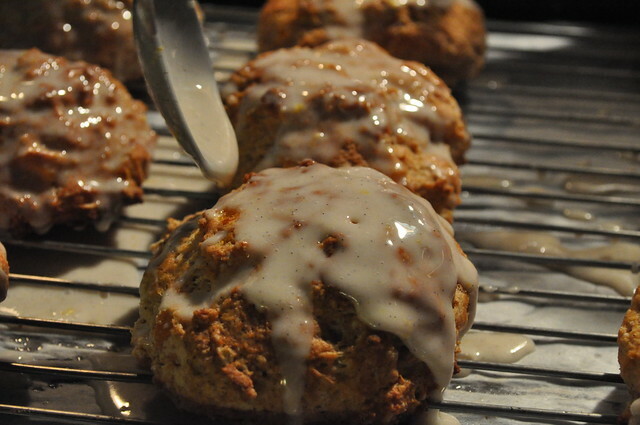 Bake for 20-25 minutes or until the scones are golden on top and firm to the touch. 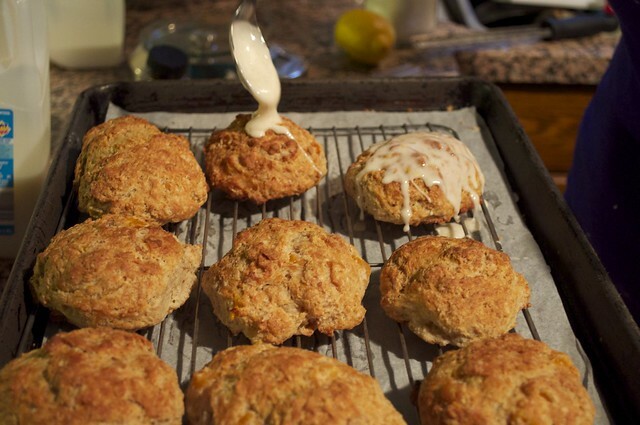 You can also check the bottom of the scones to check if they’re done. 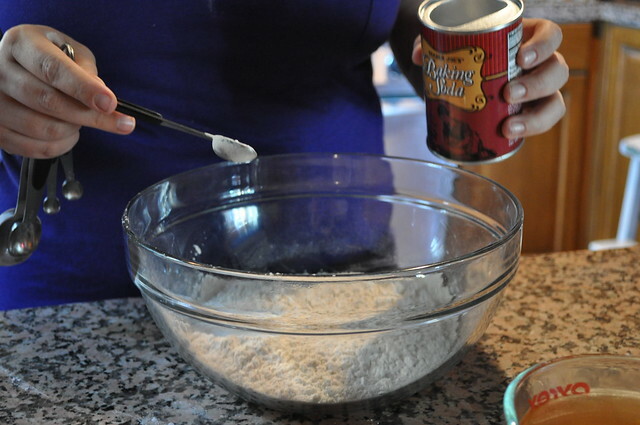 Remove from oven and cool completely before adding the glaze. 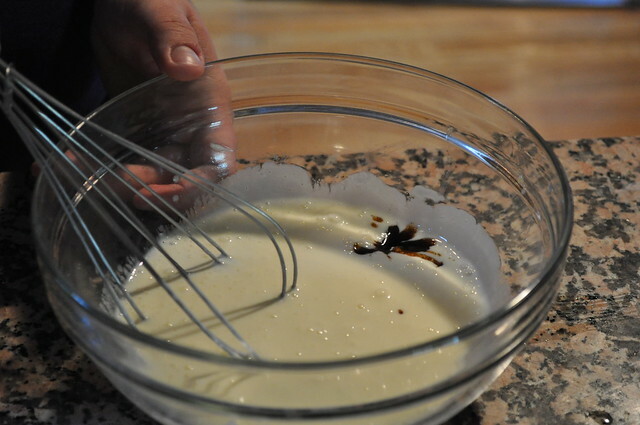 For the glaze: Mix together the milk, sugar and vanilla until smooth. 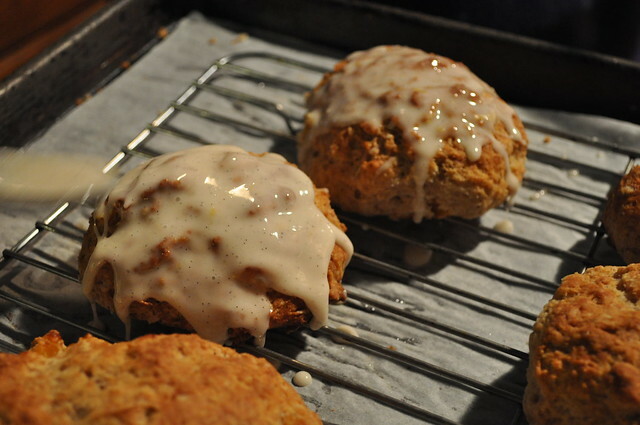 Drizzle over cooled scones. Wait about 15 minutes and then enjoy! We also made these as Blueberry Lemon and Apple with a Maple Glaze. For both, omit step two. 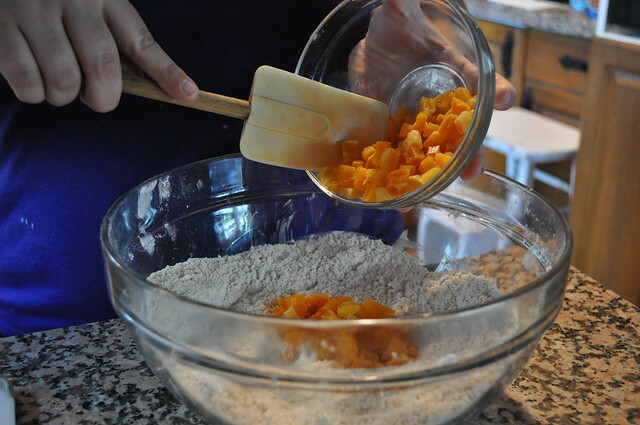 You don’t need to plump the fruit because you will use FRESH fruit. First instead of cinnamon, add 1 tablespoon fresh grated lemon zest. 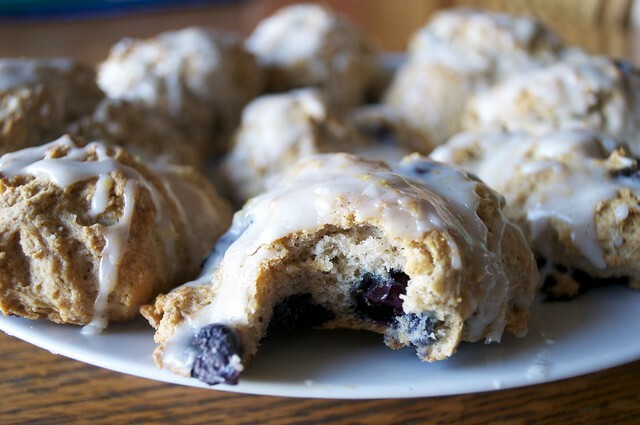 Toss blueberries with flour. 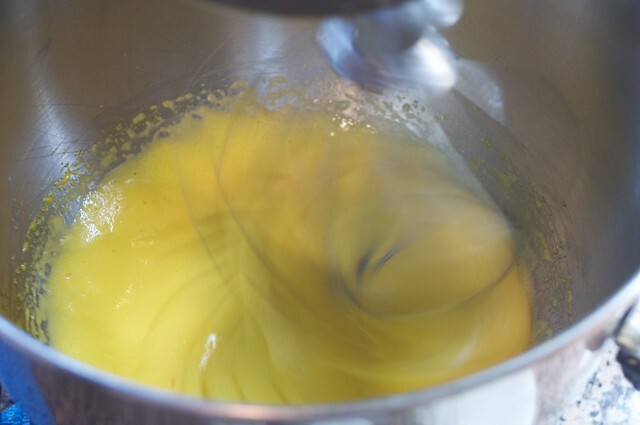 In addition to the vanilla (which we decreased to 1/2 teaspoon) add one teaspoon lemon extract. Same applies to the glaze. 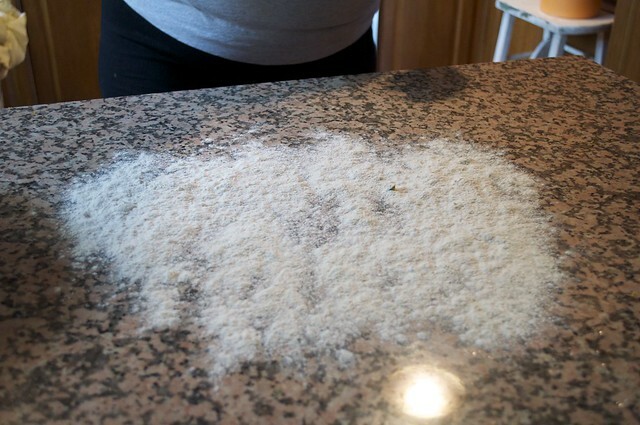 Add freshly grated lemon zest, a little lemon extract or fresh juice and enjoy. 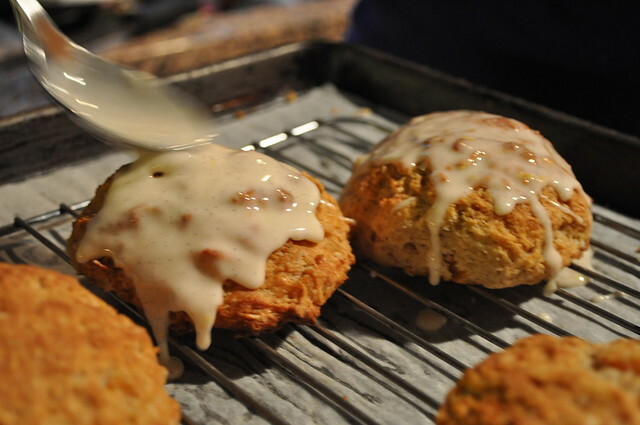 For this scone, you can keep the cinnamon and even pump it up to 2 teaspoons. We used 3/4 of a granny smith apple for the apple pieces. Chopped into small pieces. In addition to the vanilla add maple extract. Same goes with the glaze. 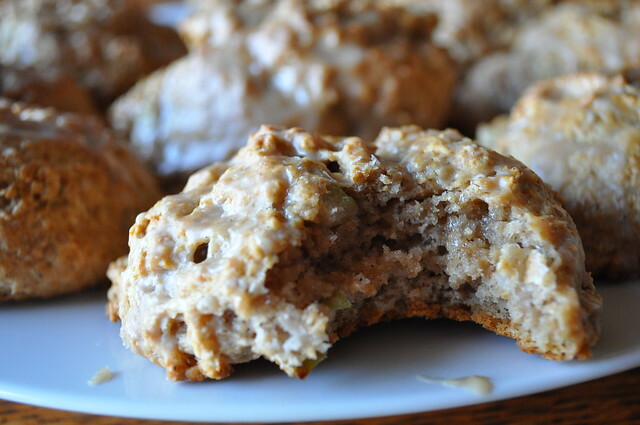 These are like mini apple fritters.